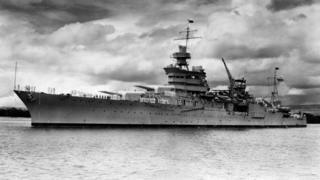 The World War Two heavy cruiser USS Indianapolis has been found in the Pacific Ocean, 72 years after its sinking by a Japanese submarine. The warship was discovered 18,000 feet (5.5km) beneath the surface. The Indianapolis was destroyed returning from its secret mission to deliver parts for the atomic bomb which was later used on Hiroshima. Of the 1,196 men on board, just 316 were rescued - the largest loss of life at sea in the history of the US Navy. Microsoft co-founder Paul Allen, who led the civilian search team, said the discovery was "truly humbling". The USS Indianapolis was destroyed on 30 July 1945 when, somewhere in the Philippine sea between Guam and Leyte, it was hit by a torpedo from a Japanese submarine. Between 800-900 escaped the sinking ship. But no distress call was ever received, and by the time the survivors were found by chance four days later, just 316 were left alive in the shark-infested waters. The ship's rapid sinking - in just 12 minutes - and the lack of a distress call meant the ship's location had long been a mystery. Mr Allen's crew discovered the vessel on 18 August, after new research from a naval historian pointed them to a specific region of the ocean where the warship had been sighted the night before its destruction. The ship is well-known for its final, secret mission, carrying parts for the atomic bomb nicknamed "Little Boy" as well as enriched uranium fuel for its nuclear reaction. Those supplies were delivered to Tinian island, an American base in the final year of the war which launched the world's first nuclear bombing. Four days later, the Indianapolis sank - less than a week before the nuclear bomb it helped to make destroyed Hiroshima in the final days of World War Two. "To be able to honour the brave men of the USS Indianapolis and their families through the discovery of a ship that played such a significant role during World War Two is truly humbling," Mr Allen said. "As Americans, we all owe a debt of gratitude to the crew for their courage, persistence and sacrifice in the face of horrendous circumstances." The USS Indianapolis remains the property of the US Navy, the search team's statement said. It will now be considered a protected war memorial. A spokesman for the survivors, 22 of whom are still alive, said each of them had "longed for the day when their ship would be found". Mr Allen's specially-outfitted research vessel, the Petrel, has been designed for exploration and research with a crew of 16. It previously discovered the wreckage of both a Japanese warship, the Musashi, and an Italian naval vessel, Artigliere - both from the World War Two era.